Willie Lewis is a bonafide Denver hero. I am very serious when I say that there should be a statue of this man in a Denver park somewhere, holding a scratchy ’50s-era 45 RPM record in his hand. Willie Lewis is an acclaimed rockabilly singer/songwriter/performer, president of Denver’s Rock-A-Billy Records and a world-class record collector. If you have ever met him, you would say that he has the unaffected personality of a wild west icon, like maybe Buffalo Bill. But most of all Willie Lewis is a hard boiled survivor. He has survived a horrible childhood blood disease (a disease that had killed all male victims prior to Lewis surviving his own procedure). He survived a rough childhood that took him in and out of orphanages, in and out of trouble and eventually landing him in Buena Vista Correctional. He survived an attack on his house and home by a PCP-crazed maniac who jumped through his window and attacked his family (forcing him to be the first in Denver to exercise the famous local “Make-My-Day” law. Yes, this is true!) And most of all, Willie Lewis has survived numerous heart attacks that have led to him having a pacemaker, a defribilator and so many stents that I cannot count them. What keeps this man alive? He is simply: Too Ornery To Die. 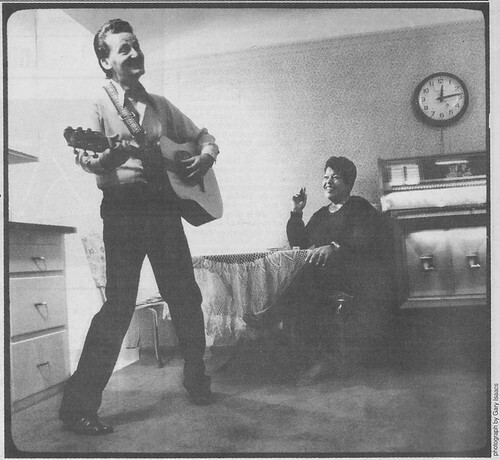 Truthfully though, there are two other factors keeping him going, the love of his life Mary Lou and his respectful dedication to the music he loves… rockabilly. And Lewis knows rockabilly. I guarantee you, no one else knows rockabilly better. Willie Lewis could be recognized as the living breathing embodiment of rockabilly personified. If you are a Denver resident and you are thinking “I have never heard of Willie Lewis”, this has a lot to do with the fact that he has never cared about commercial pop success. He knows his audience and his audience knows him. In Europe, his records from the ’80s and ’90s sell for as much money as collectable original rockabilly records from the ’50s. One rockabilly band even moved to Denver from Portugal to learn from this man. Way back in the late 1970s, after having collected every rockabilly, doo-wop, country and blues 45 many times over, Lewis thought it was about time to try to record his own 45. 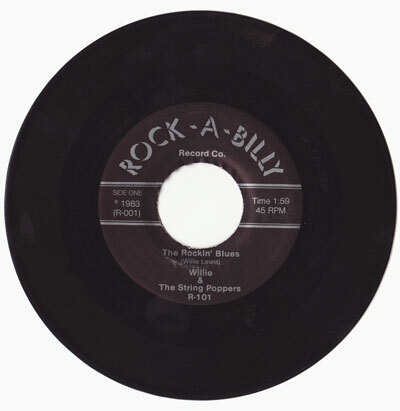 He released the famous R-101 45 “The Rockin Blues” on his own Rock-A-Billy Records, distributed by Denver’s Wax Trax store. As a matter of fact, for at least a decade, the only way you could get your hands on a Rock-A-Billy Record was through Wax Trax! Travelers from countries like Japan, Germany and Finland would always stop at Wax Trax and “load up” on rare Rock-A-Billy Records’ releases. 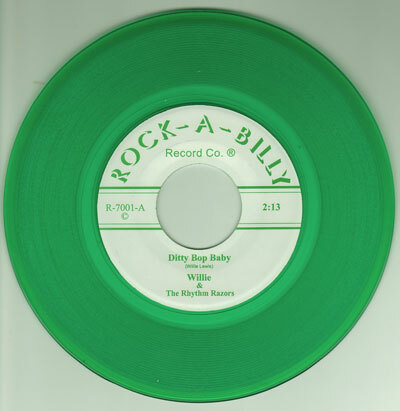 Since that first release, Rock-A-Billy Records has put out over thirty 45 RPM records (on colored vinyl, a Rock-A-Billy Records trademark), a handful of 10″ EPs, a couple of 12″ LPs, 4 or 5 CDs, and even one 10″ 78 RPM record (!) by High Noon. Not only is Lewis himself represented under names like Willie & The String-Poppers, Billy & The Bop-Cats, King Cat & The Pharoahs, The Bop-A-Whiles and Delmer Spudd & The Spuddnicks (who did an incredible show at The Oxford Hotel for the 1996 Best of Westword Showcase), but he has also released records by High Noon (from Texas), Go Cat Go (from Maryland), Ronnie Dawson (famous for his ’50s record “Rockin’ Bones”), Carl Sonny Leyland (boogie woogie pianist from England), Kidd Pharaoh (from Denver), The Road House Rockers, The Hal Peters Trio (from Finland), The Original Stablemen (from Germany), ’50s rockabilly singer Don Rader, The Barnshakers (from Finland), Little Roy & The Ramblers (from Denver), and 1995 Westword cover-story band the Tennessee Boys (from Portugal). He recently put out a great new CD by Denver band Jimmy Lee Rollins and the Rocks (starring Jim Holdridge). Aside from releases on own Rock-A-Billy Records, Willie Lewis has also released recordings on Lewmann Records, Waterhole Records, Bop-Land Records (out of Germany) and Goofin’ Records (out of Finland). There was even a large book put out in Germany with the lengthy title “The Story of a Hep Cat: Life and Music of Willie Lewis and His Rock-A-Billy Record Company” by Sven Bergmann in 2003. Lewis has recently come out of retirement and started issuing new Rock-A-Billy Records colored-vinyl 45s and has a new LP “Don’t Shoot Me Baby” on France’s Hog Maw Records that sounds ace! BuckFifty is about Denver history and here we have this amazing Denver artist who has flown under the radar for many years and is a true Denver legend. So help me here, who do I talk to about this statue? 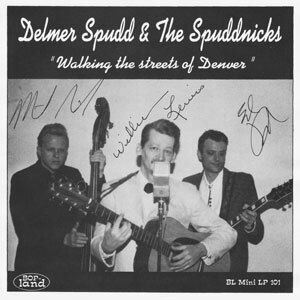 I just saw the esteemed Mayor Hickenlooper introduce X at the Bluebird on Tuesday, maybe he would be sympathetic if he knew that Denver is home to one of the truest rockabilly recording artists of all time and would realize that future generations will be hunting down the story of this amazing man. B50 Note: For more on Willie Lewis and Rock-A-Billy Records visit their website or their myspace page. 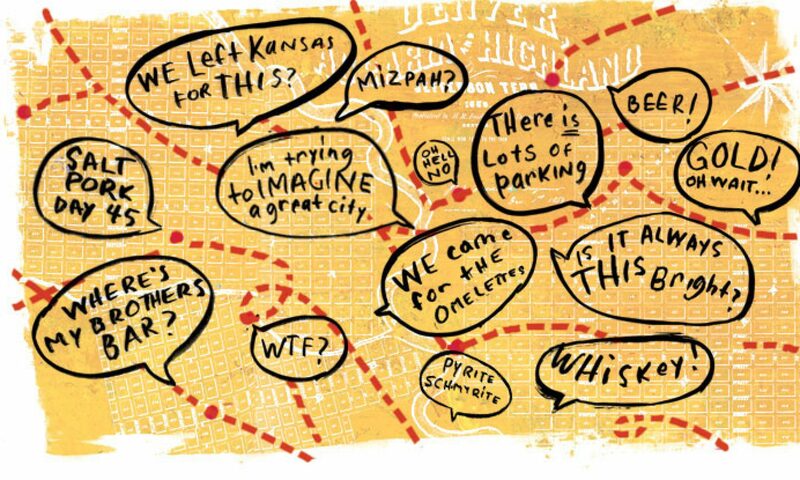 Tom Lundin is an illustrator, photographer, and chronicler of mid-century modern architecture in Denver. Find out more at his website, modmidmod.com. Aww, the audio isn’t working anymmore. I may repost this on my site someday, then. A nice, great and well deserved tribute to the most rockin´ cat in this world, as well as a nice tribute to a hell of am man and friend! Willie Lewis, what a legend of music. Great tribute you put together here. Linda. Could you or anyone give more Information about Jimmy Lee Rollins aka Lee Holdridge. I need the record date from his 45 rpm on BT Label, Rock Island “KISS ME BABY”. Jim Holdridge is a friend and associate of Willie Lewis and a member along with Lewis in the Bop-A-Whiles. He moved to Florida for health reasons (I believe), but I think he is heading back to Denver. He put out two or three 45s in the first half of the 60s. I have a copy of Kiss Me Baby, but it does not look like an original press and is not on BT. It is credited “Rock Island” as either the label name or that is given as the name of the group, it is not clear. Another is credited to the Dell-Rays and is on Boptown Records. I think both of these are from 1965, but I will ask Lewis next time I see him.